The number on this card is an 8, which is the yin/yang of life. It encompasses the light and the dark, the good and the bad. It’s a powerfully magick number because it shows the ability to take what appears to be a negative situation and extract from it beautiful lessons. He’s completed six pentacles already, which he’s hung on the tree before him. He’s working on a seventh pentacle in the present, and has one more remaining to work on. This could indicate the nearing of the end of a cycle in which he completes the eighth pentacle, then turns his attentions towards a new and different type of craftmanship. Go ahead and finish what’s been started, but be aware of surroundings and circumstances. Remember to see the good in all things, as well as the bad, and be open to receiving new and fresh inspiration for what’s yet to come. On the Eight of Pentacles we see a young man who is hammering away at a coin. He has finished six and has another coin to go. It is clear that he is in the middle of a project that absorbs all his attention. He’s isolated himself from others (the town in the background) in order to concentrate. In this scene we see the essential elements of the Eight of Pentacles: hard work and attention to detail. This card often implies a time of great diligence and focus. It advises you to hammer away at the business of the moment, whether a work project, family difficulty, personal goal or unpleasant duty. Sometimes blessings fall into our laps to be enjoyed. Other times we must put out great effort to obtain them. The Eight of Pentacles represents moments when you must give 110%. Just buckle down and do it. Fortunately, this kind of work is invigorating and leads to superb results. The labor of the Eight of Pentacles is deeply satisfying and productive. The Eight of Pentacles can also symbolize the impulse to learn – to broaden horizons (to use an old-fashioned term). Sometimes we need to develop new skills. We do research, dig out facts or search for expertise. The Hermit is looking for inner knowledge. The man on the Eight of Pentacles seeks external knowledge – the how and why of the material world. This card can also show the need for meticulous attention. People who are painstaking are often dismissed as nit-pickers, but their extra effort ensures everything is as it should be. It’s a matter of caring – taking the time to check the little details. Now is not the time to be slipshod or casual. Look for errors, and tie up loose ends. The key to success is an extraordinary effort. Whatever your task, the Eight of Pentacles tells you to give it your all in every way. 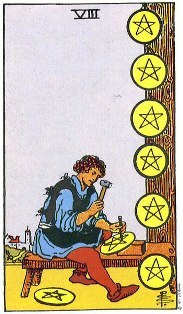 An apprentice works on eight pentacles. This is the apprentice card. It is a card of starting over, doing something new or perhaps just expanding. Apprenticeship can be scary or demoralizing, as in all those cliched movies where the Kung Fu youngster has to carry water and sweep floors before he can do the real stuff. Similarly, this card predicts, if not a tough time, a time of learning and mistakes, doubts and just hard work. The Querent needs to be told to keep up their courage, to either make this move into a new job or to stick with it if they’ve already made the move. Being an apprentice (or an apprentice again) will teach (or re-teach) them how to persevere. *NOTES TO SELF: I’m pretty happy with my interpretation as it stands, I hit head on with the absorbtion and the separation from the town, as well as with the high quality of the craftmanship. However, I also like the interpretation of being attentive to detail and paying attention to the finer aspects. That should be incorporated into my own readings, as should the bit about strength and apprenticeship. I don’t think I saw “apprentice” in my mind’s eye, but more “expert”. I’d think to signify an apprentice would show another person in the card, teaching or demonstrating what’s to be done, whereas this person in this card looks to me like they know full well what they’re doing. However, because of the “monotony” of what’s being created, the “cookie-cutter” fashion I’d described, it makes sense to me that “practice makes perfect”. So, while I’m not at all displeased with how I’ve been interpreting this card, I can see where I can add to it: novice, practice, attention to detail, and the strength to keep going.